Welcome to the Sun Spot: Global Feel Good Center: BEE POLLEN......Got Gold? The oldest remains of bee known to exist are preserved in a small bit of amber kept at the American Museum of Natural History in New York. The bee inside is believed to be over 80 million years old.Throughout the ages the bee has been revered by man. The Bible, the Talmund, the Torah, the Koran (the code of Islam), along with the scrolls of the Orient, the writings of Ancient Greece and Rome, the legends of the Russian and Slavic people, even the relatively recent Book of Mormon (1830), all praise the industrious and healing foods created by her and found in her beehive. In the Bible alone, the bee's nectar is mentioned 68 times. Traveling back in time, we find the honeybee was revered, even deified in many religious cultures. The book of the Hindu's, the Rig-Veda, penned in Sanskrit between 2000 and 3000 BC, talks of bees almost with awe. Vishnu, the powerful Preserver and Protecter of the Hindu trinity of gods, is often symbolized as a blue bee on a lotus flower. The east Indian god of love, Kama, wields a bow with a string made of an entwined chain of bees. In cultures worshipping a goddess of fertility, variously named Venus, Diana, Ceres, Cybele, or Iris bees were invariably considered sacred and were minor deities in their own right. Spring fertility rites often used the bee as a symbol for the festivities. No other living creature, other than man, has been held in such high regard by so many diverse cultures. 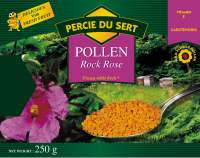 Key specialist on pollen: "Patrice Percie du Sert"
Pollen itself is the male seed of flowers, required to fertilize the plant. Every single flower in the world puts forth a dusting of pollen, as do many orchard fruits and agricultural crops. Bees are responsible for the pollination of more than 80 percent of the earth's foliage. Bee pollen is the pollen produced by flowers that honey bees gather and bring back to the hive. 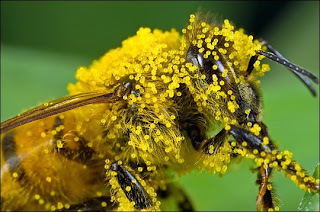 These pollen grains are microscopic in size and bees collect millions of these individual grains and connect them with nectar into small pellets. Beekeepers collect the pollen from the bees by placing a collection device at the entrance to the hive. This device gathers between 10% and 50% percent of the pollen that the bees are carrying, leaving sufficient for the hive's needs. Bee pollen is an alkaline food considered by nutritionists to be one of the most complete foods found in nature and is a rich source of high-quality protein since it contains all the essential amino acids plus quite a few more. Some of the amino acids present include: cystine, lysine, histidine, arginine, aspartic acid, threonine, glutamine, proline, glycine, alanine, valine, methionine, isoleucine, leucine, tyrosine, phenylalanine, and tryptophan. Bee pollen contains vitamins A, B, C, and E, and is extraordinarily rich in most of the B vitamins, including folic acid (folate). Some of the minerals included in bee pollen include: barium, boron, calcium, copper, iodine, iron, magnesium, manganese, phosphorus, potassium, selenium, sodium, and zinc. Bee pollen contains over 5,000 enzymes and the phytonutrients (such as co-enzymes, bioflavonoids, phytosterols, and carotenoids) found in bee pollen also number in the thousands. Bee pollen is 15% natural lecithin. * Increases energy and stamina. * Increase muscle growth and definition. Start by using one Tablespoon (14.2 grams) of Bee Pollen each day for children over 5 and adults. Increase serving if desired. Bee Pollen blends well with smoothies or other drinks, or it may be eaten plain as a snack food by the spoonful.